In Strange Food History, we're hitting the books -- to find you the strangest, quirkiest slices of our food heritage. Today: A loaf of bread that's transcendental. Thoreau went into the the woods because he wished to live deliberately, but when he came out he may have brought one of our favorite types of bread with him. According to Thoreau scholar Walter Harding, who pulled the information from a 1943 Ladies' Home Journal article: "Thoreau experimented frequently with his bread making and soon learned that an unleavened variety was simplest. When he added raisins to the dough, it was said that he became the inventor of raisin bread. Concord housewives were reportedly shocked at the innovations." Some historians have since renounced this claim after unearthing recipes that mention dried grapes in bread as early as the 1700s. No matter where it came from, we're sure that living alone at Walden Pond gave him plenty of time to perfect his cooking (even if he was lacking in kitchen space). The hidden truth to this story may have been the use of the grapes to provide wild yeast as a source for natural fermentation / leavain for Thoreau's loaf. I love this nugget - thank you! Food history is so much fun. I hope this Features topic will keep on. I love Thoreau. But I’m imagining him in his Walden cabin, less than two miles from his family’s house, getting his granola groove on. Dried fruits (esp grapes) have been around since one million A.D., right? So he’s getting a little hungry and figures out his bread will taste better if it has something tasty in it. Because he doesn’t know how to cook! His mother did it for him! And he doesn’t want to have to walk to her house! If he had stayed at Walden a little longer, he probably would have figured out stromboli. 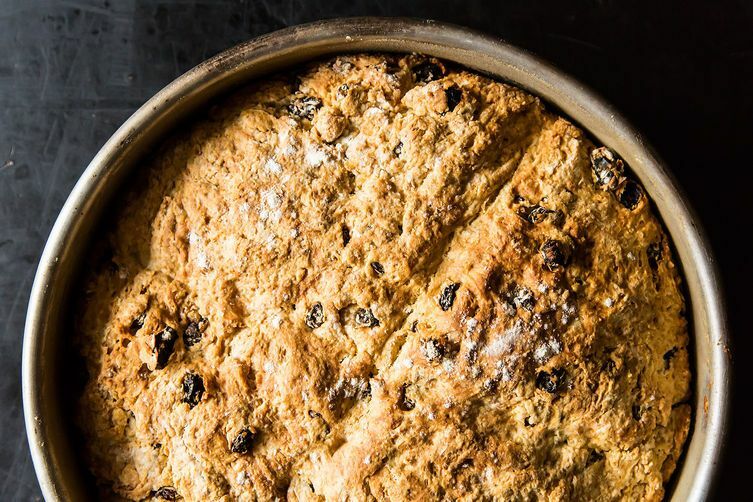 That looks a whole lot like Irish Soda Bread.